Recognized for his excellent reputation in the employee rights field, Mr. Franck is known for his professional and zealous approach. Mr. Franck has spent his entire career advocating for employees and has obtained consistent results on behalf of his clients. He has extensive trial experience, which includes being lead counsel in more than ten jury trials. He has won multiple trials and arbitrations, and has achieved numerous favorable settlements. Mr. Franck represents employees in all areas of litigation including trials, appeals, arbitrations and mediations. Mr. Franck has a proven track record of success. Mr. Franck has won multiple trials, including verdicts of up to $1.3 million dollars. In addition, Mr. Franck has obtained numerous favorable settlements on behalf of his clients. Because of that, Mr. Franck was selected for inclusion in Super Lawyers – Rising Stars Edition, for 2013, an honor given to no more than 2.5 percent of the lawyers in California. Mr. Franck has also helped expand the legal protections of employees in California. He has two published Court of Appeals decisions to his credit (Blum v. Superior Court, B189560 and Franklin v. Mondanock Company et. al., B191267), both of which are cited by legal treatises for their expansion of the law. In fact, Mr. Franck’s representation of an employee in the Franklin case was the first to establish a cause of action for wrongful termination in violation of public policy under OSHA when an employee complains about death threats and attacks in the workplace. 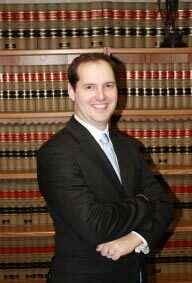 Prior to becoming a licensed attorney, Mr. Franck excelled in law school, receiving his J.D. from the University of Southern California (U.S.C.) where he graduated in the top 10 percent of his class (Order of the Coif). During his time at U.S.C. Mr. Franck was a member of the school’s Law Review and his student note entitled “The cost to older workers: How the ADEA has been interpreted to allow employers to fire older employees based on cost concerns” was published in the seventy-sixth volume of the U.S.C. Law Review. In law school, he assisted non-profit employees on legal matters through the school’s Employer Legal Advice Clinic. Mr. Franck grew up in Utah and graduated from the University of Utah with an Honor’s degree. Mr. Franck graduated with a double major in Political Science and Economics and minor in Philosophy. His honor’s thesis on international relations was published by the Honors Committee and is held at the University of Utah Marriott library. Personally, Mr. Franck is the proud father of two boys and his wife works for public television.